This album reminds me of Nine Inch Nails, less Trent Reznor vocals and more punk/post punk elements. 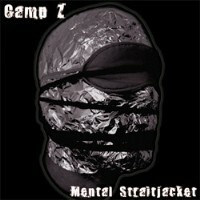 Camp Z fuses together punk, post punk and industrial like a well-made milkshake. With Mental Straitjacket, the band has achieved a conundrum of noise industrial rock that takes the listener into the depths of his mind and forces him to stare at it right into the face. Although I am less enthusiastic about the vocal sampling on most of the songs, each of the tracks are unique and offers a great selection of rock and punk tunes that will definitely get you totally delirious just by listening to it. Inspired by a variety of real and historical social events, the band aims to interpret the present time by using various heavy guitar riffs, samples, drum beats, noises, keyboards and vocals. However, it’s not difficult to ascertain that the band has a special place for punk and rock in their hearts. Initially developed as a solo project by Manu/Zorch, the band ended up being a four piece group who shared the same love for rock and punk beats as well as some DIY ethos. Some of their primary influences include artists like Crisis, Les Tétines Noires, Madre del Vizio, Kommunity FK, Violet Stigmata, Ministry, Bérurier Noir, Death in June and pretty much anything underground.